of the Fleur De Lis Shapeabilities Pendants and cut it in half on the diagonal and mounted it evenly on either side of the largest labels 4 die cut. The flowers are Prima. Hope you have time to try a card using a word stamp as the focal point. Thanks for stopping by today. Ahh, it's Monday already? How did that happen? 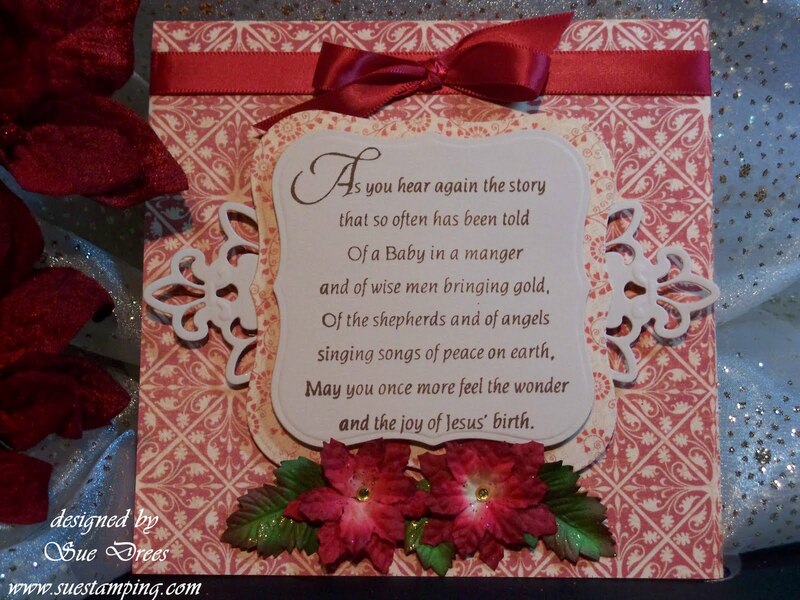 This is a beautiful card with the main focus on a very special set of words. Nice job, as always, Sue. Can't wait to see what you post next! I love this card! I agree that we should put beautiful sentiments on the front more often! Sue, I got your project done this weekend. Please e-mail me your address and I will try to get it in the post this week! I love your Frosty Boy and all the other supercute creations Sue! Ohh Sue,what a beautiful card,i love the image and flowers. This is beautiful and what a great sentiment - love the Fleur D.L. too.